The CRA is redesigning the streetscape of Binney Street (from 3rd to Fulkerson), Galileo Way and a portion of Broadway (from Ames to Galileo) in Kendall Square. The intent is to incorporate a continuous separated/raised bike lane (cycle track) using the latest complete streets design principles, new landscaping and a redesign of the intersections along the way. It will connect the protected cycling infrastructure that was built on Vassar Street 10 years ago all the way around the Binney/Galileo curve to meet up with the new cycle track on Binney Street between 1st and 3rd. This design project is a collaboration between the Cambridge Redevelopment Authority (CRA) and the City of Cambridge Department of Public Works (DPW), Traffic Parking & Transportation (TPT), and Community Development Department (CDD). This design project is funded using CRA funds generated in the Kendall Square Urban Renewal Area. Working alongside the DPW, TPT, CDD, and Fire Departments, property owners, and community groups, in 2017, the design team will present alternatives. The primary deliverable of this project is to take the final selected alternative and create 25% design drawings that will be used by other parties to construct the improvements in phases over the next 3-10 years. This project will not reconstruct the roadway. Above: New section of Binney Street opened in 2015 between 1st and 3rd Streets. This redesign project intends to continue the raised cycle track. 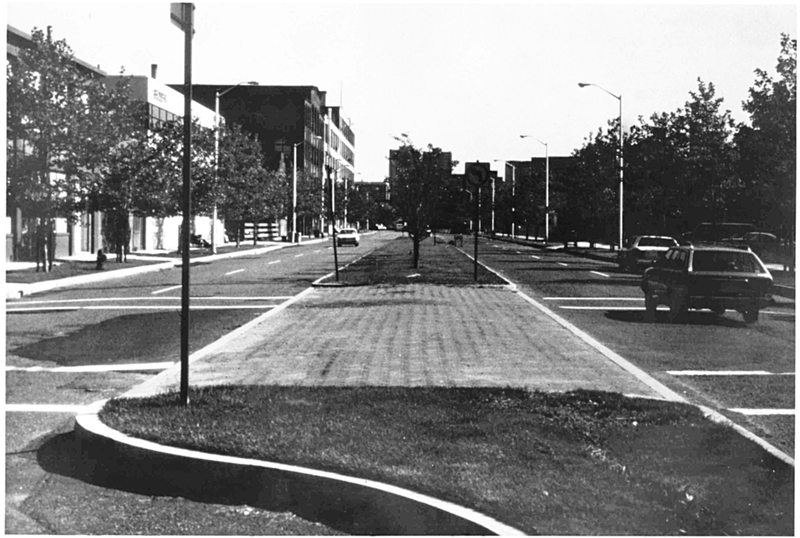 As part of a goal of the Kendall Square Urban Renewal Plan (KSURP) to attract new development in the 1960’s through 1980’s, the CRA widened many roads in Kendall Square, in an effort to enhance mobility. The successful focus on transit oriented development and transportation demand management since then has created an opportunity to revisit various street designs to better match the multi-modal goals of the City of Cambridge (City) and the Commonwealth of Massachusetts, consistent with current transportation behavior trends in the area. Over the past 10 years, many of the streets in and around the KSURP area have been rebuilt, usually reducing travel lanes and expanding facilities for pedestrians and bicyclists. The roadway projects have been implemented by various parties (City, MassDOT, MIT, Alexandria Real Estate) and completed with various funding sources (CRA, federal earmarks, City Chapter 91, private developer capital) at different times and with different designs. The CRA and the City have taken a leadership position on creating a unified design for these important streets and intersections. As new development proposals are permitted, a pre-approved design can be handed to an applicant for applicable portions of the streetscape related to their development proposal. This will lead to a more streamlined development process for both the City and developer, and a more consistent public realm. A bike lane has been present along this corridor for over a decade. However, given the higher speeds of vehicles and the large volume of truck traffic, this corridor was identified by the City’s 2015 Bicycle Network Plan as a location for a separated bicycle facility. Such an installation will be consistent with the City’s Complete Streets Policy and recent adoption of the national Vision Zero pledge. Cambridge is consistently rated one of the most walkable and bicycle friendly cities in North America and has one of the nation’s highest bike to work rates. The City has been on the forefront of using progressive street design principles and national best practices to constantly improve the comfort of the pedestrian and bicycle experience. Above: Section of Broadway between Ames and Galileo that will be redesigned in this project. The City and the CRA maintain a strong commitment to environmental sustainability, including collaboration on the creation of the Kendall Square EcoDistrict. This design project will seek to be responsive to the sustainability goals and stormwater issues facing Kendall Square, and consider the implementation of innovative green/blue infrastructure concepts. 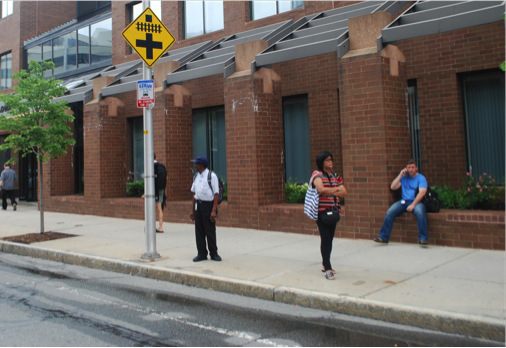 Above: Images of existing bus stops that will be part of this redesign project. *Note: for additional detail on what are considered minimum components of the roadway redesigns, please go to page 7 of the RFP. *Note: for additional detail on what are considered minimum components of the intersection redesigns, please go to page 8 of the RFP. Above: Intersection of Broadway and Galileo to be redesigned as part of this project. Above: Example of a Protected Intersection from an unknown city in the U.S. What is a protected intersection? Click here to find out. The CRA has been working closely with community planners in CDD who are managing the design of the future Binney Street Park and their design team, Stoss Landscape Urbanism. This streetscape redesign project will help inform the park design team (Stoss) of the location and size of the sidewalk along the Galileo side of the park, landscaping treatments along the curb edge, as well as the placement of future bike infrastructure connecting the park to the larger Cambridge Bicycle Network. Note, however, that the park project will be constructing only the portion of the new streetscape design from the current curb line inward. The park project will not be reconstructing Galileo or Binney Streets, or building the raised cycle tracks that are found in this redesign project. More information on the Binney Street Park Design process can be found here on CDD's website. The CRA is committed to ongoing direct coordination with stakeholders to ensure that the result of this streetscape redesign project is a set of realistic, actionable, 25% design drawings. Feedback from those who own property or have planned development projects along the corridor, those who operate public transit services along the corridor and those who may be implementing the design in the future as part of their planned development projects, has been or will be incorporated during the design process.